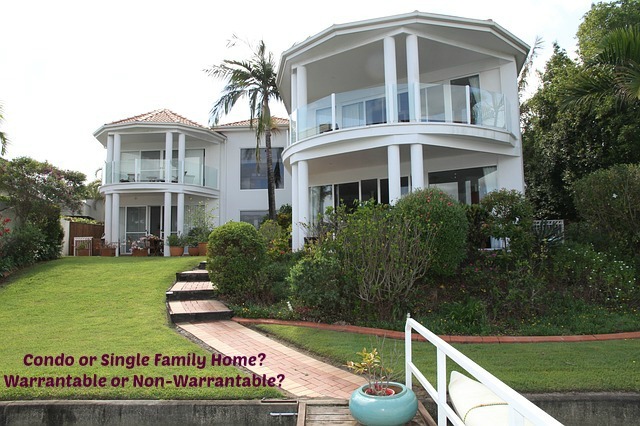 What's the difference between a warrantable & non warrantable condo? What's the difference betwen a warrantable & non warrantable condo? This post is part 1 of a short series of blog posts on condominium financing. Recently, I've had many inquiries about financing programs for condos, condotels, and non-warrantable condos, and along the way I've found there's a lack of education on the subject. To begin, it's important to understand what a 'condominium' is. It is not actually a type of building or property, but a legal definition of the way certain real estate is owned. This explains why sometimes a townhome is considered a condo, but the exact same look/style home may be considered a "single family attached" property instead of a townhome. In a condominium, generally an owner owns the interior of their unit, and has joint ownership of common grounds, recreational areas, and infrastructure, with the other members of the community. When it comes to mortgage financing, condos are (very) generally separated into 2 classifications - warrantable & non-warrantable condos. A "warrantable" condo is simply a condominium that is eligible for financing that can be sold directly to Fannie Mae and/or Freddie Mac. Loans for warrantable condos follow conventional underwriting guidelines. Most lenders lend freely on warrantable condos, with rates and programs comparable to those found available for single family homes. With "non warrantable" condos, things can get a little more tricky. Since a non-warrantable condo is not eligible for financing that can be sold to Fannie Mae or Freddie Mac, many lenders consider them a higher risk. Some lenders won't lend on non-warrantable communities at all, while others will offer funds, but only with larger down payments and/or higher interest rates than those seen for warrantable projects. The good news is, financing IS available for non-warrantable condos, and the rates don't have to be terrible. A condo can be considered non-warrantable for many reasons, including unfinished phases, too high a percentage of investment ownership, a single owner owning too large a percentage of the community, and many other reasons that I'll get into more detail about in a future post. The best way to determine whether a condo is warrantable or non-warrantable is to have the builder or homeowners association complete a "condo questionnaire". This form asks many questions that are used to determine a condo's eligibility for conventional financing, and is required for condo loans for both conventional loans and portfolio lending products. Have a question about condo financing? Ask an expert here! Curious about mortgage rates for warrantable VS non-warrantable condos? Check out current rates here. It would help if listing agents would enter their condo listings accurately in the MLS. Excellent overview of what a condo is and what the warrantable status means. I agree with Lenn about entering listings correctly. There will be several listings in the same complex - some are listed as condos and some as single family homes. Non warrantable is even more of an issue when it comes to value. Great explaination on the differences. Good morning John. What an excellent and informative post. Very nicely done. John - I recently had a client interested in purchasing a condotel--she was surprised to learn a 40% down payment was required. Great explanation. Deal with lots of condotels in this area now. Right now Compass Bank has some great condo financing here locally. You may have it California also. John, that's very valuable information for people things of buying a condo. John: I have to believe that most of us 'seasoned' agents have encountered non-warrantable condos in the past and it is one of the primary questions I ask before scheduling a showing for one of my buyers. Thanks for sharing! Great explanation of these uncommon terms to the layman outside of mortgage finance. Very well explained John! Definitely some important information for buyers to know. Good concise explanation of the two terms. Some of these things you only learn about when you encounter them. We discovered a new non-warrantable condo problem just recently when the HOA of the complex decided to not put any money in the reserves from their yearly budget and then fudge the condo cert when we ordered it! It is important that agents are aware of the ramifications of unwarrantable condos. John Meussner I'm dealing with several condos right now! Great explanation! John, Great explanation. So many people (Realtors included) are confused about this designation. This is great information on condo financing. It is always good to know the situation before finding out that you will not be able to get a mortage. Interestting I have been in the business 9 years and never came across this. John Meussner - Good to know for agents even before they go out to show property. Their buyer might not qualify just with the down payment amount. Hella M. Rothwell that's very true. Agents make life easy on themselves by learning about the different condo's available in their location, too. Knowing whether a buyer will need 30%+ down VS the standard 5% can eliminate a lot of unnecessary showings and time wasted.